Everyone loves and appreciates art from a distance, but what if you could have personalised wall art in your own space by professional artists, who spend time and effort creating beautiful designs, murals and colours in cafes, restaurants and homes. Here’s a list of them you can hit up in case you want to stare at something beautiful for a change! A group of friends have come together to make some amazing art at cafés and restaurants in the city. They go by the name Wall-D. Their first project was a backpacker’s hostel and then there was no looking back from there. They’ve beautified cafés, restaurants and gym walls since then. Give them a shout if you’re hating your white blank walls right now. As the name suggests, they literally do ‘art on the wall’. Their sole aim is to give artists an opportunity to go mainstream by doing some fabulous art and murals in spaces like homes, offices, outdoors, events, cafes etc. They have different themes you can chose from, or give them an idea you may have and they bring it to life. PCO loves mixing social concerns with art. 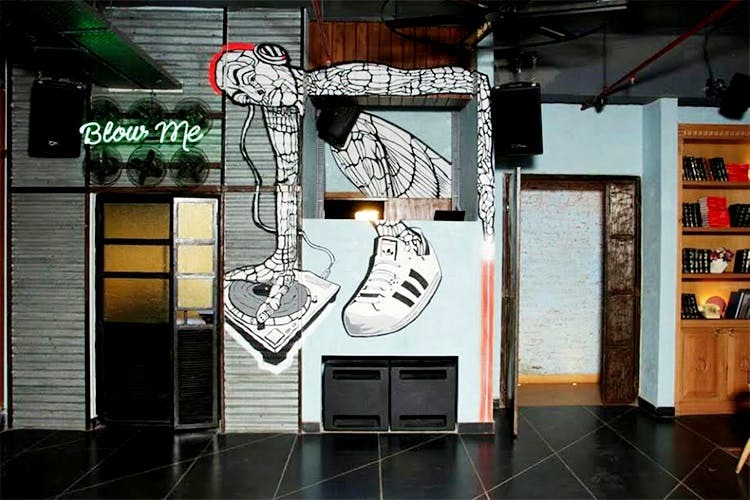 He paints the streets with impactful social messages and also takes upon wall art projects in cafes and restaurants. As the name suggests, he started his journey creating art in people’s loos and eventually came to be known as The Bathroom Painter. He’s a travelling artist who hails from Bangalore and does a fabulous job on any kind of wall he’s given to work on. He’s done art for cafés restaurants, salons, gyms and of course homes. Harsh Raman Paul is a well-known graffiti artist from Delhi. He mostly indulges in street art but his work is so pertinent and hard hitting, we had to write about him. You’ll find some fabulous work done by him in some brothels at GB Road in Old Delhi.